The bill rejected in April was resubmitted to the parliament. 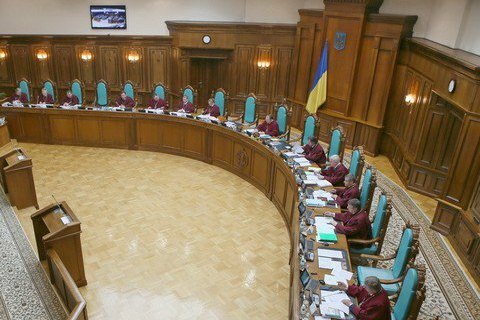 The Verkhovna Rada by a narrow majority of 231 votes with the minimum required at 226 adopted the new version of the law "On the Constitutional Court" as a basis. The bill was prepared by the Presidential Administration. On 11 April, the Rada rejected a similar bill No. 536-1, but the document was returned to parliament under a different registration number. The document provides for a change in the structure and the scope of powers of the CC, end sets forth a procedure for reviewing a constitutional complaint. The bill also suggests a competitive procedure for the selection of candidates for the position of a Constitutional Court judge. Under to the bill, the Constitutional Court will include six colleges, two senates and a Grand Chamber. The court will have the right to issue injunctive resolutions and suspend any legislative norm, the constitutionality of which is disputed. The bill introduces responsibility for non-fulfillment of decisions of the Constitutional Court. The bill suggests a significant increase in the salary of CC judges of up to 75 subsistence minimums (about 120 thousand hryvnia). A retired judge of the Constitutional Court will receive a life-long pension at 50% of his or her salary. The bill suggests introducing the institution of a special adviser, which may be a competent foreigner in this matter, but not a citizen of Russia, in order to provide expert assistance in constitutional processes on constitutional complaints. The measure is seen as temporary and will expire in 2020. The work of the special adviser will be provided through international technical assistance or international donor organizations.